Kirby Building Systems, a global leader in pre-engineered steel building (PEB) systems, plans to make significant efforts to penetrate the vast African market following its success in the Middle East. “We will be venturing into that area more aggressively because we see strong potential. Currently, we export about 10 per cent of our output to Africa and want to increase that to 20 per cent. We wish to create new channels and deepen our footprint in existing markets and open up new ones,” said Hatem Turki, Kirby’s Kuwait-based sales and marketing director. “Our main consideration is maintaining the competitive edge over our rivals and making the best of the capacity we have at our disposal through ‘effective utilisation’,” he said. Kirby has in all five plants including two in the Gulf in Kuwait and Ras Al Khaimah (UAE), two in Hyderabad and Haridwar (in India) and one in Vietnam, contributing to total annual capacity of 425,000 tonnes. Sales of Kirby Building Systems, a subsidiary of Alghanim Industries, rose 15 per cent in the Gulf in 2014 over 2013. Turki said Saudi Arabia accounted for most of Kirby’s sales in the Middle East and Africa region, followed by the UAE and Kuwait. Kuwait contributed a fifth of total sales and projects completed in the state in 2014 and included warehousing PEB projects for companies including Agility and KGL as well as buildings for oil and gas industry players Kuwait National Petroleum Company and Kuwait Oil Company. Kirby officials at the seminar. “The business outlook looks good. While oil prices have been down, we’ve hardly noticed any effect on the GCC’s main markets. Growth is occurring in all sectors – commercial, industrial and logistics in the GCC countries,” he said. “We wish to capitalise on our three major markets of Saudi Arabia, the UAE and Kuwait where we see further potential. Now our Gulf focus is expanding to Qatar where we’re investing in sales operations. Just yesterday we held our business seminar there,” remarked Turki on the sidelines of a similar business seminar in Bahrain last month. Kirby has been active in Bahrain where it has participated in several major projects. The official said Kirby’s R&D (research and development) department is constantly working on improving existing offerings and introducing innovations for a market that has become increasingly competitive and demanding. 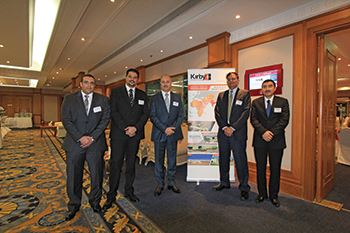 At the seminar, held at the Gulf Hotel in Manama, Turki provided an overview of Kirby’s history, production facilities and manufacturing processes. He spoke of the advantages of Kirby PEBs, highlighting top-grade technical expertise, world-class business practices and seamless processes across all its functions and verticals, offering of aesthetic designs, speed of construction, earthquake-resistant features, durability and flexibility. “We have the best engineering team in the industry and large capacity to build huge buildings. We do global sourcing for the best products and complete projects within the delivery time. 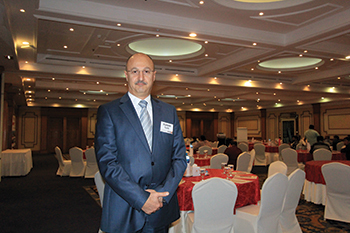 Customers have access to local support, a sales network and certified builders,” said Turki. He noted that architectural aesthetics was increasingly driving commercial sector PEBs, unlike in the warehousing field. This meant that PEB manufacturers have had to adapt to requirements through innovation and skills. There was a greater emphasis on detail. He highlighted that Kirby had excelled in keeping pace with changing markets and that “we would like to always share our knowledge with our partners, contractors and consultants”. Architects, building contractors, consultants and partners based in Bahrain attended the seminar that included presentations by K Vasudev, sales manager for Bahrain, Qatar and Oman, and Mohammed Elsayed Saber El Gamil, engineering manager, pre-sales.